Bhubaneswar: On Thursday, a delegation of seven villagers of Talakai Padar, Narsikai Padar in Odia Pentha Panchayat, have met with Member Secretary of Odisha State Pollution Control Board at Bhubaneswar Office to ventilate their grievance about the damages caused by the Kodingamali Bauxite Mine, Laxmipur Koraput run by Odisha Mining Corporation. The Bauxite Mining project of Odisha Mining Corporation in Kodingahill that started in February 2018 against the wishes of local inhabitants, without consent of gramsabhas and ignoring the concerns of local inhabitants have damaged the local agricultural land, environment and water bodies. On 12th October 2018, the mining over burden ( mine rejects) have flooded into the agricultural lands of the local villagers in Talakai Padar and Narsikai Padar village. The same incident has damaged the individual lands recognised under Forest Rights Act and the entire land is now of no more use. The land owners who have suffered the damage are sambru Hikaka, Inki Praska, Bharat Khikaka, handra Hikaka, Jaga Hikaka, sindhu Praska, Purna Hikaka, Sapura Hikaka and many other from Talakai Padar Village. Given complaint to District Collector soon after the incident but no action has been taken as on date. Here in Bhubaneswar also they have given representation to the Member Secretary of Pollution Control Board on 1st November and demanded for site inspection followed appropriate action against OM for the damage caused to their land. The mine water drainage and surface runoff has polluted the local streams which are lifeline of the local community. Few of such streams locally called as Utan Jola, Gunji Heini, Misini Miringi, Grispa Haan, Jai Mandin, Dangiri Jhola, Munda Jhola, Jading Jala, Kaja Miring, Lukka Padar, Ambili Bara, Karki Jala, Kida Baara, Barada Ganda, all these streams are located in Talakai Padar village are completely polluted. People have started complaining of skin diseases because of the mine contaminated water. Apart from this, because of transportation of minerals from the mines three hundreds of trucks are plying on the village roads and causing air pollution in the nearby villages and for that no remedial measures are being taken. In this regard the villagers requested the Member secretary of Pollution Control Board to make a site visit to the affected villages and inspect the area in question and take urgent action so as to prevent the disaster and necessary measure to check the water and air pollution. 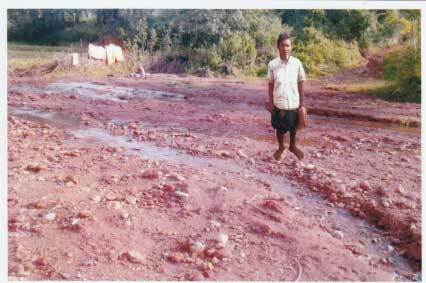 They further demanded till the conditions are fully complied the mining operation may be directed to be stopped.